Summary from BN.com: A dusty carved box containing two locks of hair and a century-old letter regarding property in Switzerland, and a burning desire to learn about her biological family lead nurse-midwife Lexie Jaeger from her home in Oregon to the heart of Pennsylvania Amish country. There she meets Marta Bayer, a mysterious lay-midwife who desperately needs help after an Amish client and her baby die. Lexie steps in to assume Marta's patient load even as she continues the search for her birth family, and from her patients she learns the true meaning of the Pennsylvania Dutch word demut, which means 'to let be' as she changes from a woman who wants to control everything to a woman who depends on God. I shouldn't have been surprised at how much I enjoy this book. Every Mindy Starns Clark book that I've read includes such a good mystery story that I find myself completely sucked in as I try to solve it along with the characters. Lexie's search to find out what happened to her birth mother is intriguing as she discovers all sorts of secrets about her birth family. There's a lot of digging deep and bringing up hurt, lies and jealously. It doesn't end up happily but I actually really enjoyed that a lot more than if everyone ended up with hugs and kisses. I felt as frustrated as Lexie did with reading at all the road blocks she kept coming across during her search due the adoption process. I realize that there are legal issues but it seems that it's not fair for an adult to not be able to just find their birth parents even though the information is there. Interestingly this is the second book recently that I have read that deals with the practice of being a midwife. I don't have any desire to be one and I will probably end up going to the hospital if/when my time comes but I do find learning about the practice to be fascinating. Unlike a previous book that I read that didn't really talk about the practice even though the main character was a midwife, this book goes into a lot of detail about the hardships and joys of helping women in labor. While much is spent on the characters being happy to help the women, there are also the legal ramifications that come into play and also that those who do go to hospitals are not shown in a bad light. I only had two qualms while reading. One is that there were times I felt Lexie to be a bit ignorant or just not very socially adapt. The beginning of her story found me annoyed with her by her actions of lack of not knowing things that I would have thought, by her heritage, she should have known. However as the story progressed her character began to change and therefore became more likable for me. The other is the title of this book and I how I feel it's being marketed. 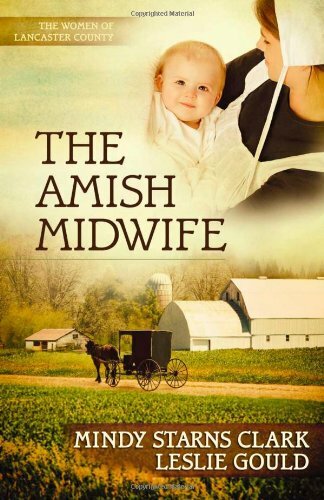 The title implies that Lexie is a midwife that is Amish. However she is Mennonite and most of the people who she has direct contact with are Mennonite. Yes, she does go out to the Amish and is a midwife to some of them but that are not all that she helps. However neither the summary nor the cover gives this distinction and along with the title, a reader would think that the book is just another Amish story. I'm just hear to tell you that it is not. For those of you who are worried that the Amish lifestyle is romanticized or idealized, Clark and Gould do not do this. The mystery and the midwife practicing are more of the focus of the story and just happen to have it set in Amish country. Other than this, the story is an absolute gem. It's a lot of fun to read and very informative about midwifery and adoption practices as well. Clark's mystery/suspense is top notch and Gould's characterizations work well. Even if you're not an Amish fan, I still think that this book can be enjoyed by those unfamiliar with the lifestyle. I'll be looking forward to future books in the series. Ack! How did I not know Mindy Starns Clark had a new book coming out!?!?! I've failed. Glad to hear you enjoyed it, though!